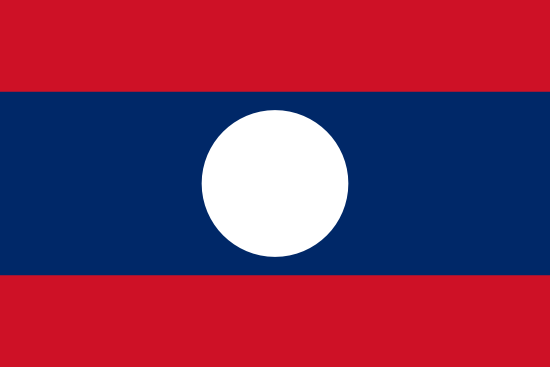 The Lao People’s Democratic Republic (Lao PDR) is a landlocked country situated in Southeast Asia, bordering Thailand, Cambodia, Vietnam, China and Myanmar. Despite a recent increase in the rate of urbanization and a relatively small amount of arable land per capita, most people in Lao PDR live in rural areas and work in an agriculture sector dominated by subsistence farming. Lao PDR’s economy relies heavily on its natural resources, with over half the country’s wealth produced by agricultural land, forests, water and hydropower and mineral resources. All land in Lao PDR belongs to the population as a whole. The state administers the land on the people’s behalf, and individuals and organizations access land through land-use rights. Recent land titling programs have formalized permanent land-use rights in urban and peri-urban areas, and land allocation programs have formalized temporary land-use rights for agricultural and forest land. Communal tenure, which is common in rural areas, has not been formalized. Individual use rights in rural areas are short-term and insecure. Land concessions to foreign investors are controversial in Lao PDR due to their social and environmental impacts. The Government of Lao PDR (GOL) has expressed its intention to address these issues when revising the land law. Although draft amendments were submitted to the National Assembly in 2012, the revisions have not yet been adopted. The GOL has expressed its intention to create an overarching program of land reforms, including the introduction of a new land law. Within this framework, the GOL plans to create a system for establishing and registering communal land rights, as well as procedures that can be applied to balance stakeholder interests in large-scale acquisitions of land. The government also will develop the legal and implementation framework for completing land titling, with a focus on replacing temporary use rights to agricultural and forest lands with more permanent, secure rights. Donors could support the GOL in its land-sector reform efforts, including efforts to create an effective legal framework that accomplishes the following: establishes rights to communal land; creates adequate procedures for large-scale land investments; and incorporates customary land governance functions. Donors could also explore ways to assist the GOL in establishing a legal and implementation framework for formally recognizing long-term secure rights to agricultural and forest lands. Donors could work with the GOL to ensure that positive lessons from the World Bank’s previous program in Lao PDR to include women’s names on land titles are applied to new legislation and programs. Most of the proposed development of hydropower, minerals and forest-based programs will be implemented in remote areas of the country where poverty levels are high and people depend heavily on natural resources for subsistence. One notable forest program is REDD+, a program of the Forest Carbon Partnership Facility that builds upon the original Reducing Emission from Deforestation and Forest Degradation (REDD) program to include support for conservation, sustainable forest management and enhancement of forest carbon stocks. The GOL often grants land concessions in rural areas where local communities are less able to assert their interests in the land and natural resources than the concessioners can over the land that GOL is providing to them. Even when well-drafted legislation provides for community consultation and participation in GOL decisions on investment and development of natural resources, in practice benefit sharing and support for local partnerships and other forms of community engagement are extraordinarily difficult to implement effectively. Possible solutions – including capacity-building, legal literacy training, access to legal resources to support meaningful local participation and technical assistance in enterprise development – will require the GOL to develop comprehensive strategies and pay focused attention to implementation. Drawing on experience with the large hydropower project, Nam Theun 2, and projects in other countries, donors can assist the GOL by helping design an overarching strategy and cross-sector approach to ensure that local communities, particularly the poorest and most marginalized, are able to participate meaningfully in developing natural resources and that benefit-sharing is locally relevant, democratically controlled and long-term. Large initiatives, such as USAID’s Feed the Future program and the REDD+ program, offer potential opportunities to extend existing projects. Extension activities could include building the capacity of local communities to do the following: secure rights to land and natural resources; negotiate with the government, project planners and potential investors regarding land use and development opportunities; and develop systems for local governance of natural resources. The GOL is in the process of creating and revising the legal frameworks governing water, forests and minerals and has identified two needs: (1) to protect and strengthen community rights to those natural resources; and (2) to protect against negative impacts that could result from development of natural resources. In particular, the GOL has struggled to develop the institutional support needed to implement laws, especially provisions that address mapping and monitoring natural-resource use and enforcement of local rights and environmental protections. Allocations of rights to exploit natural resources through concessions, licenses and leases should, in the interests of transparency and conflict avoidance, include verification and audit requirements and be subject to local review. Donors can draw on experience from other countries to help the GOL identify and address gaps and establish necessary governance bodies and mechanisms for control and enforcement of rights to natural resources. In addition to providing support for legal frameworks, donors should continue efforts to assist the government in creating and strengthening core institutions at the local level as well as appropriate links between the institutions and the public. Many rural residents supplement their income by engaging in small-scale and artisanal mining on a part-time or seasonal basis. A significant percentage (as high as 75% in some surveys) of these miners are women. Much of the small-scale and artisanal mining sector operates without regulatory oversight, leaving significant potential for negative outcomes: exploitation of miners by middlemen trading in raw minerals; dangerous mining practices; and environmental degradation. Donors can assist the GOL in creating appropriate strategies for developing the small-scale and artisanal mining sector. Technical assistance is needed to help draft and implement legislation and pilot programs to regularize artisanal mining rights and provide small business development support, with particular attention to supporting women miners. Technical assistance is also needed to establish and implement appropriate safety standards for miners and the communities in which they operate and to ensure that environmental standards are enforced. Despite its mostly mountainous terrain and limited arable land, Lao PDR is primarily a rural and agricultural society. Most Lao citizens rely on subsistence agriculture for their food and livelihoods. Only 10% of Lao PDR’s land is classified as agricultural, while 77% of the population works in the agricultural sector, mostly on family farms. Urbanization is estimated to be 5% annually. Although it is still considered a least developed country, Lao PDR has grown economically and has made significant progress in poverty reduction since the 1990s. Land degradation and unexploded ordnance, especially in the most remote areas, present additional challenges to accessing agricultural land. Lao PDR is a one-party communist state, and all land belongs to the nation as a whole and is managed by the government. Land rights are mainly governed by the 2003 Land Law, under which all land is ultimately owned by the national community, but the law obligates the state to safeguard long-term use of land by ensuring protection, use, usufruct, transfer and inheritance rights. Most rural land is held in small plots, averaging 1.6 hectares. Beginning in the 1990s, Lao PDR began to formalize individual land-use rights and strengthen tenure security through land titling and land allocation programs. Land titling was implemented in urban and peri-urban areas, with the eventual (though yet unrealized) goal of extending it throughout the country. The project was considered moderately successful, distributing titles for 122,934 parcels, 85% of the government’s target. A land title is evidence of permanent land-use rights, which can be bought and sold, mortgaged or bequeathed. In rural areas, the state distributed temporary land-use certificates (TLUCs) for agricultural and forest land. TLUCs are valid for three years, and the use rights evidenced by a TLUC can be bequeathed and inherited but cannot be sold, leased or used as collateral. As of 2005, the TLUC program had been systematically implemented in two-thirds of officially recorded villages in Lao PDR. More recently, budget constraints have slowed implementation and follow-up activities. Thus, many TLUCs have expired and have not been renewed. Rural holders may also prove their land-use rights with a Land Survey Certificate, Land Tax Declaration or Land Tax Receipt. Communal tenure, under which local communities control common property such as upland areas, grazing land, village-use forests and sacred forests, is prevalent in rural areas, although the state does not yet formally recognize such tenure. Rural families may also hold informal rights to agricultural land allocated by traditional authorities under informal or customary rules. National law provides that women and men shall enjoy equal property rights, and women also can inherit land under many customary systems in Lao PDR. Although land titles in urban areas have been issued on a roughly equal gender basis, land allocation programs in rural areas have been less successful in including women’s names on TLUCs. Private investment (both foreign and domestic) in agriculture as well as industry has increased in recent years due to the liberalization of Lao PDR’s economy. The government has approved large land concessions to private investors, mostly from China, Thailand and Vietnam. Increased investment along with population growth and increased formalization of land tenure systems have led to a more mature land market and increasing property values. However, when investors’ promises of improved infrastructure and employment that are often part of proposed compensation packages have not materialized, land investments have harmed local populations by depriving them of access to land without their receiving anticipated benefits. In relation to its relatively small population, Lao PDR has an abundance of water, forests and mineral resources. In particular, hydropower, timber, gold and copper have in the last decade contributed steadily increasing portions of the country’s GDP and export revenue. The natural resource base supports the continued development and expansion of these sectors, and their contribution to the country’s economic growth is expected to continue to increase in the decades ahead. By some estimates, hydropower and mining will contribute more than 25% of GDP by 2020, and the combined revenues from those two sectors are expected to grow by more than 20% by that time. Given this potential, the pressure for rapid and broad-based development of hydropower and mineral exploitation is enormous. The GOL, with support from donors, is well along in its race to develop and implement comprehensive legal frameworks and governance structures to support sustainable use of the nation’s natural resources. However, significant gaps remain, especially at local levels where implementation of pro-community provisions and programs depends on the capacity of local officials. Laws and policies include aspirational statements of environmental protection, community participation and local benefit-sharing, but the local governance structures needed to realize these goals are often not in place or function poorly. Lao PDR is situated in Southeast Asia, bordering Thailand, Cambodia, Vietnam, China and Myanmar. The country is landlocked and contains 23,080,000 hectares of land. The landscape is mostly mountainous with some plains and plateaus. The highly variable climate is characterized by a wet season and a dry season. The population is approximately 6.3 million and growing at a rate of 1.4% annually. Approximately 66% of the population lives in rural areas. The estimated annual rate of urbanization is about 5%. Lao PDR’s population growth is concentrated in rural areas (CIA 2012; World Bank 2012a; Lefroy et al. 2010; World Bank 2012d). 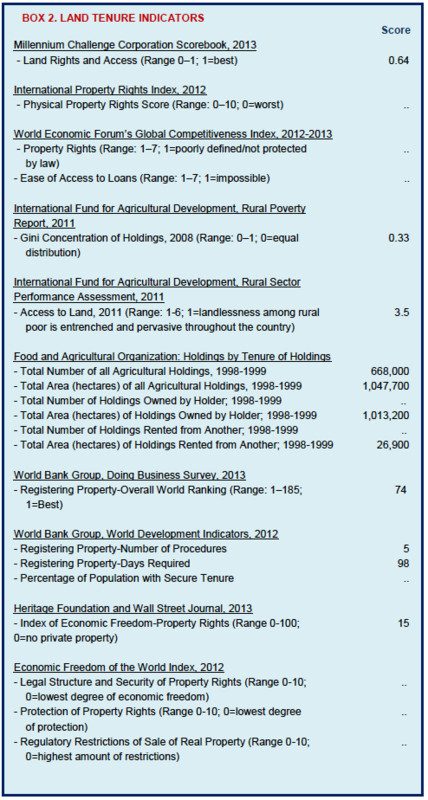 In 2011, Lao PDR’s GDP was US $8.3 billion, with 31% attributed to agriculture, 35% to industry and 34% to services. More than half the country’s wealth comes from its agricultural land, forests, water and hydropower potential and mineral resources. Lao PDR’s economy has performed well in recent years with an annual GDP growth rate of 8%. Lao PDR’s top export commodities are wood products, coffee, electricity, tin, copper and gold. Its main export partners are Thailand, China and Vietnam (World Bank 2012a; World Bank 2010; CIA 2012). Approximately 10.3% of the country’s land area is classified as agricultural with about 6.1% considered arable, 0.4% used as permanent cropland and about 3.8% used as permanent meadow and pastureland. About 11% of agricultural land lies fallow. Lao PDR’s quantity of arable land is limited by its mountainous terrain; approximately 70% of the country’s land has a slope of more than 20 degrees. Much of the arable land (including 43% of all intensive agricultural land) is located in the flood plain of the Mekong River and its tributaries. Rain-fed and irrigated farming systems are practiced in the lowland flood plain of the Mekong and its tributaries (typically used for rice cultivation in the wet season and fallow or grazing land in the dry season), while swidden/slash-and-burn agriculture is often practiced in the mountainous uplands (FAO 2009; World Bank 2012a; FAO 2008). Lao PDR’s main crop is rice: 77% of Lao households grow rice. Eighty-five percent of rice-growing households produce during the wet season only and 14% during both the wet and dry seasons. The country’s other top agricultural products are sweet potatoes, vegetables, corn, coffee, sugarcane, tobacco, cotton, tea, peanuts, cassava, water buffalo, pigs, cattle and poultry (World Bank 2005; World Bank 2006b; CIA 2012). Although roughly 13% of agricultural land (or 1% of total land area) is equipped for irrigation, much of this land is not effectively irrigated during the dry season (FAO 2009; World Bank 2005). Lao PDR has 30 wetland sites, covering about 1 million hectares (4% of total land area). The country’s largest wetlands are located in Champasak, Savannakhet and Vientiane Capital (IUCN 2011). Lao PDR is thickly forested. Forests cover about 68% of Lao PDR’s land area. About 17% of Lao PDR’s land area is nationally protected (CIA 2012; World Bank 2012a). Urbanization has increased in recent years. The population has gone from 83% rural in 1995 to 66% rural in 2011. Lao PDR defines urban land broadly. Villages are considered urban so long as they are near district or provincial government offices, have more than 600 residents or 100 households, have access to roads for motor vehicles, contain a majority of households with electricity and have a market. Under this standard, there are about 960 urban villages in the country. The highest proportion of urban population lives in Vientiane Capital. Much of Lao PDR’s urban land is held under private long-term use rights (similar to private ownership) as a result of land titling in larger cities and towns. Rapid growth of urban populations has increased the need for improved infrastructure (GOL 2005a; World Bank 2012a; Rabé et al. 2007; World Bank 2005). Land degradation is a constant concern in Lao PDR. The Food and Agriculture Organization (FAO) considers 84% of Lao PDR’s land to be at least moderately degraded. Most of the country’s land has a slope of 20 degrees or more. This factor, especially when combined with the types of soil and heavy rainfall in the wet season, leads to soil erosion, particularly in the northern uplands where slopes are steeper and soil quality is poorer. Additionally, the poverty prevalent in the northern uplands leads to the unsustainable exploitation of resources, an increasing demand for land and shortened fallow periods, all of which contribute to more land clearance, depletion of soil nutrients and lower agricultural productivity. Population growth, village relocations and increased investment in agriculture, infrastructure and mining projects have further increased pressure on land and led to more degradation. Land clearance and deforestation characteristic of the swidden agricultural system practiced in the uplands, along with illegal logging, lead to further soil erosion. To combat soil erosion and land degradation, in recent years the GOL has discouraged swidden agriculture and promoted community-based forest management and more stabilized production through the introduction of tree crops and livestock production (Lestrelin 2009; World Bank 2005; GTZ 2009; World Bank 2006b; Yokoyama et al. 2006). Lao PDR also has a large amount of unexploded ordnance (UXO) remaining in rural areas from bombings during the Indochina War. The presence of UXO poses an additional impediment to accessing and using land, especially in the poorest districts (World Bank 2005; UNDP 2012a). Lao PDR was established in 1975, after the fall of the constitutional monarchy, as a new one-party communist state. This followed decades of civil war and the country’s involvement in the Second Indochina War (1953–1975). Lao PDR is a mainly rural and agricultural society. Two-thirds of the country’s population lives in rural areas, and 77% of Lao PDR’s labor force – including 81% of its female labor force – works in agriculture. As of its last agricultural census in 2010/2011, the country contained 1,021,000 private households, 783,000 of which were agricultural households. In a previous census (1998/1999), 93% of total landholdings were considered owned (under owner-like possession), while only 2% were rented, 1% was under some other single-tenure form, and 4% operated under two or more forms of tenure. Rural households in Lao PDR rely heavily on agriculture as a source of household food and income. Rural women contribute labor for a large proportion of agriculture in Lao PDR, including 50–70% of paddy and upland rice growing, 50% of household animal husbandry, at least 50% of cash crop production and most of household vegetable gardening (Lastarria-Cornhiel 2007; UNDP 2012a; World Bank 2006b; World Bank 2012a; World Bank 2012d; FAO 2008; Gorsuch 2007; FAO 2012a; FAO 2012b). Following the establishment of the one-party communist state, all of Lao PDR’s land was nationalized; beginning in 1978, the government began collectivization initiatives in an effort to redistribute access to agricultural land and increase productivity. The effort was unsuccessful, and by the mid-1980s only about 40% of farmers had joined cooperatives. By the late 1980s all farming collectives had dissolved in favor of individual land rights and individual family production. Although most land remained effectively under control of families who had owned the land before collectivization, accurate histories of prior ownership are difficult to determine, as the formal land documentation that had existed under the kingdom was destroyed in 1975 after the war. In an effort to clarify property rights and tenure security and modernize land administration, the GOL began titling land in urban areas and allocating land in rural areas in the mid-1990s (Vandergeest 2003; Lastarria-Cornhiel 2007; World Bank 2006b). Smallholder subsistence farm families, which use few purchased inputs and cultivate primarily rice, dominate Lao PDR’s agricultural sector. These farmers have little connection to the cash economy, and most are self-employed or use unpaid family workers. The farmers and their families consume most of the rice that they grow, marketing less than 10% of their production. Rice accounts for 67% of the calorie intake of the average person in Lao PDR. The average size of an agricultural holding is 1.62 hectares, with bigger farms in the south and smaller ones in the north. Thirty-six percent of farms use one hectare or less, 36% use between one and two hectares and 27% use more than two hectares. Only 13% of holdings are less than one-half hectare. In addition to private use land, many rural households also use village land and communal forests (World Bank 2006b; Gorsuch 2007; FAO 2008; GTZ 2009; FAO 2012b). The agricultural sector has grown 4.7% annually over the last decade, with an increase in the amount of land cultivated and the number of agricultural workers. In particular, cash crop and livestock production have grown due to increased foreign investment, reduced barriers to trade and public investments in roads and irrigation (World Bank 2012d; World Bank 2006b). Lao PDR has two main rural regions: the lowlands and the uplands. About 50% of the population lives in the lowlands, 30% in the uplands and 20% in overlapping areas. Although agriculture is the primary occupation and way of life for residents of all rural areas, farming methods differ: the lowland flood plain of the Mekong and its tributaries is characterized by rain-fed and irrigated farming systems, while swidden agriculture techniques are typically used in the mountainous uplands. The lowlands of the Mekong Corridor have the most fertile land, the best infrastructure and the densest population. The uplands are more remote and have poorer farming conditions, including acidic soils, steep slopes and a high risk of erosion. Rural poverty is highest in the uplands and lowest in the Mekong Corridor, Northern Lowlands and Vientiane Plain (World Bank 2006b; UNDP 2012a). Despite recent economic growth driven by an increase in foreign investment, Lao PDR remains one of the poorest countries in Southeast Asia and is considered a least developed country. The government has put much effort toward alleviating poverty; the percentage of the population living below the national poverty line decreased from 39% in 1998 to 28% in 2008. Poverty is primarily rural. In 2008, 32% of the rural population lived below the national poverty line, a substantial drop from over 52% in 1994. Lao PDR’s urban poverty rate was about 17% in 2008. Poverty is especially persistent among ethnic minorities in remote rural areas, in the uplands and on the borders of Vietnam and China (World Bank 2010; UNDP 2012a; World Bank 2006b; GOL 2008c). Lao PDR is ethnically diverse, officially recognizing 49 ethnic groups in four ethno-linguistic families (Lao-Tai, Mon-Khmer, Sino-Tibetan and Hmong-Mien). About 55% of the population is Lao, 11% is Khmou, and 8% is Hmong. The remaining 26% are a mix of other ethnic groups. Most ethnic minorities live in the upland areas of Lao PDR, where the incidence of poverty is higher than in other areas of the country. Villagers in upland areas rely on agriculture and forest products for their livelihoods. Remote villages where ethnic minorities live typically have poor access to infrastructure, markets, agricultural land and government assistance (Mann and Luangkhot 2008; CIA 2012; Andersen 2011; RRDTC 2009). The formal law governing land rights in Lao PDR includes the 2003 Constitution, the 1990 Law on Property, the 2003 Land Law, the 2004 Law on Protection and Development of Women and the 2005 Law on Heritage and Basis of Inheritance. The Constitution guarantees that the state will protect property and inheritance rights of individuals and organizations. It also declares all land to be a “national heritage” and that the state will ensure use, transfer and inheritance rights to land as defined by law. The 1990 Law on Property establishes and defines five forms of property: state property; collective property; individual property; private property (property belonging to a private economic unit other than an individual or collective); and personal property (items for personal use). It also establishes that ownership of all land, underground resources, water, forests and wild animals is vested in the state, though the state may grant rights of possession, use, transfer and inheritance to other entities (GOL Constitution 2003a; GOL Property Law 1990b). The 2003 Land Law lays out the scope of land-use rights. All land is owned by the national community, and the state must safeguard long-term rights to land by ensuring protection, use, usufruct, transfer and inheritance rights. The Land Law lays out categories of land (agricultural, forest, water area, industrial, communication, cultural, national defense and security and construction) and defines the scope of use rights for each. It also establishes the basic organization of land-use management authorities and framework for land registration. The Land Law provides the basis for registering land rights and defines land certificates and land titles. The process for requesting and distributing land-use rights documents is elaborated in Decree 88 on the Implementation of the Land Law (GOL Land Law 2003b; GOL Decree 88/PM 2008a). The Land Law provides that land titles shall constitute evidence of permanent land-use rights, and establishes a system of temporary land-use certificates for agricultural and forest land, allowing rights to such land to be passed by inheritance, but not transferred, leased or used as collateral. The Land Law also does the following: allows Lao citizens to lease land from the state for up to 30 years; allows the state to lease out land or grant land concessions to non-citizens; prohibits land speculation; and guarantees compensation for state takings of land use rights. The Land Law provides for settlement of land disputes before the local land-management authority or before the People’s Court (GOL Land Law 2003b). The Land Law was scheduled to be revised in 2012, and draft amendments have been submitted to the National Assembly, but none has yet been adopted. The GOL has indicated that this revision will provide a legal framework for large-scale land reform. In addition to revising the Land Law, the GOL has also drafted a new comprehensive national land policy that prioritizes increased local land management. The GOL also plans to focus on increasing access to land and tenure security for rural households as part of its continued efforts to alleviate poverty (PR Newswire 2012; Sengdara 2012). The 2004 Law on Development and Protection of Women and the 2005 Law on Heritage and Basis of Inheritance govern matters related to marital property rights and inheritance (GOL Law on Development and Protection of Women 2004; GOL Law on Heritage and Basis of Inheritance 2005b). The 2009 Law on Investment Promotion defines the principles, regulations and measures for promotion, protection and management of investments and lays out rules for granting land leases and concessions to investors (GOL Law on Investment Promotion 2009). Customary systems of land management and allocation exist alongside the formal system, with initiatives in recent years to integrate some traditional practices into the formal law. In many rural areas of Lao PDR, communities control common property, such as forests or pastureland, and have devised local customary rules for the management of land resources and allocation of land to group members. The 1990 Property Law recognizes cooperative or communal property rights generally. The Prime Minister’s 2006 Decree 88 on Land Titling and the current National Socio-Economic Development Plan include provisions to issue communal land titles for land allocated by the government to village communities. In January 2013, the GOL issued the first community land titles for agricultural and forestry land to five villages that had been relocated as part of preparations for construction of the Nam Theun 2 hydropower dam and reservoir. The GOL plans to issue community titles to the other nine villages that were relocated under this project as well (UNDP 2012b; Lastarria-Cornhiel 2007; Seidel et al. 2007; Liu and Sigaty 2009; GOL 2010b; Sayalath et al. 2011; LIWG 2013). All land in Lao PDR is state property. The state can grant individuals and organizations short- or long-term use rights. A land title is evidence of permanent land-use rights, which in practice resemble private property rights. Property rights evidenced by a land title can be bought and sold, mortgaged or bequeathed. Land titles are common in urban and peri-urban areas (Lastarria-Cornhiel 2007). In rural areas, holders of land-use rights can obtain a temporary land-use certificate (TLUC) for agricultural or forest land. These are issued under the land use planning and allocation program. TLUCs are valid for three years, and the rights a TLUC evidences can be bequeathed and inherited but cannot be sold, leased or used as collateral. By 2006, over 330,000 households (about half of all rural households in Lao PDR) had been issued TLUCs. Although in theory the rights evidenced by a TLUC can be converted to permanent land-use rights over time, the law provides no clear mechanism for this conversion to take place. Many TLUCs are expired, and, in practice, the land-use rights evidenced by TLUCs are informally exchanged or transferred (RRDTC 2009; GOL Land Law 2003b; World Bank 2006b; Lastarria-Cornhiel 2007). Rural families may also request a Land Survey Certificate (LSC) to prove permanent land-use rights. Rights evidenced by LSCs can be bought, sold, mortgaged and bequeathed (GTZ 2009). Local authorities may also issue a Land Tax Declaration or a Land Tax Receipt. In rural areas, land users sometimes use these documents as proof of land-use rights or to assert compensation claims when land concessions occur. However, these documents cannot be used to transfer land rights (GTZ 2009). Under customary or informal rules in rural areas, local communities often control common property, including upland areas, grazing land, village-use forests and sacred forests. All community members are entitled to use communal land, and village authorities may grant similar use rights to those from surrounding villages. Communal tenure systems have evolved over a long period and vary from village to village. There is no formal registration process for communal tenure, though it remains an important part of the cultural, political, social and economic frameworks of rural communities (Lastarria-Cornhiel 2007; Seidel et al. 2007; Sayalath et al. 2011; World Bank 2006b; Liu and Sigaty 2009; Mann and Luangkhot 2008). Rural families may also hold land use rights – to homestead plots, paddy land or land for swidden agriculture – under informal or customary rules. Such land-use rights may be allocated by customary local authorities under local rules. For example, the village head (Nai Ban) or local administrative committee may allocate swidden agriculture plots to village households and mark the temporary boundaries on an annual basis. Customary tenure systems vary from village to village. Nai Ban may issue a Village Heads Certificate on Land Ownership, which while not valid on its own, may be used by local authorities to resolve disputes or used by the family as additional proof of ownership when applying to the state for an LSC (Lastarria-Cornhiel 2007; FAO 2012a; World Bank 2006b; Mann and Luangkhot 2008; GTZ 2009). Although all land in Lao PDR is owned by the state, the GOL began land titling and land allocation programs in the 1990s to formalize permanent and temporary land-use rights for individuals and organizations (Lastarria-Cornhiel 2007). The goals of the land titling program were as follows: to improve tenure security in areas with rapid land development; to encourage development of efficient land markets; and to increase government revenue. Land rights evidenced by titles can be bought and sold, bequeathed and inherited and used as collateral for credit. Land titling has reduced land disputes in urban and peri-urban areas overall, although new disputes based on inheritance have emerged. Many households in urban and peri-urban areas have titles to their land (World Bank 2006b; Lastarria-Cornhiel 2007). For agricultural and forest land, which covers most rural areas, the government may issue temporary land-use certificates (TLUCs) under the Village Land Use Planning and Land Allocation Program. TLUCs are valid for three years, and rights evidenced by TLUCs can only be transferred through inheritance. The program has been implemented systematically. Land authorities have worked village by village, delineating village boundaries, designating types of land (agricultural, forest, etc. ), allocating agricultural land to specific households, issuing TLUCs and preparing land-use contracts and village land-use agreements. For the sake of expediency, local participation in the land-use planning process has been limited (Lastarria-Cornhiel 2007; GOL 2008b; RRDTC 2009; Lestrelin et al. 2010). The goals of the TLUC program are to provide more secure land tenure, reduce the practice of swidden agriculture and substitute more stable practices, and alleviate poverty by teaching farmers to focus on a narrow range of crops so they can produce a surplus and build linkages to markets and the cash economy. Because of a lack of infrastructure and poor connection to the rest of the country, these goals could not be met in the most remote villages, many of which are inhabited by ethnic minorities. As discussed below, the GOL has relocated some villages under the program (World Bank 2006b; GOL 2008b; RRDTC 2009). As of 2005, the GOL had implemented the TLUC program in two-thirds of all officially recorded villages in Lao PDR. The results of the TLUC program have varied throughout the country, but GOL’s objectives have not been fully met, in part due to reduced funding for the program and its administration. Independent researchers have found that the program has been useful in defining village boundaries, reducing land conflicts and leading to overall agricultural growth. However, allocation was carried out rapidly, with limited local participation and without full consideration of customary tenure systems. In some cases, the TLUC program has reduced villager access to and use of agricultural and forest land, especially communal village resources, reducing farm yields and leading to less secure livelihoods. The program has also widened the gap between some village households, favoring early settlers over more recent settlers such as young families and new migrants (Lestrelin et al. 2010; RRDTC 2009; World Bank 2006b; Fujita and Phanvilay 2008; Mann and Luangkhot 2008; Seidel et al. 2007). The GOL has not established a follow-up process or consolidated land information systems, and outside observers have noted that many TLUCs are expired and not renewed. Also, rights evidenced by TLUCs are sometimes informally traded or exchanged. The GOL’s plan to eventually extend land titling throughout the country has not yet materialized. Lack of tenure security and lack of knowledge of legal land-use rights remain problems in rural areas (World Bank 2006b; Lastarria-Cornhiel 2007; GOL 2008b). Since 2000 the budget for the land allocation program has declined, reducing the capacity of district offices to continue implementation and monitoring. In districts where implementation has continued, it was done quickly and without an attempt to understand and incorporate customary tenure and management practices into the allocation plan. Budget constraints have also prevented implementation of agricultural extension services and follow-up activities, such as renewal of expired TLUCs (Fujita and Phanvilay 2008; GOL 2008b). Land Survey Certificates (LSCs) prove permanent land-use rights in rural areas. LSCs operate much like land titles, and property rights evidenced by an LSC can be sold, mortgaged or bequeathed. Other than a project operating in two provinces and funded by the German Organization for Technical Cooperation (GTZ), the GOL has not issued LSCs systematically. Rather, the GOL usually issues LSCs in response to individual requests submitted to the district land office or provincial land management agency. As of 2007, GOL had issued about 150,000 LSCs countrywide, covering less than 20% of rural households. A Land Tax Declaration, issued by the District Land Tax Division, allows the holder to use the land, and may be used to record transfer of the right by inheritance. Local authorities also issue Land Tax Receipts for tax payments. Although Land Tax Receipts are not transferable by law, villagers do use them as evidence of their rights, including for the purpose of selling or leasing out the land. Most rural land users have at least a Land Tax Receipt showing that they have paid tax on the land they claim. Citizens can use Land Tax Declarations and Receipts as evidence of land use when applying for an LSC (GTZ 2009; Ngaosrivathana and Rock 2007). Rural families and communities may also hold land pursuant to informal or customary rules. Customary land tenure systems, consisting of local informal rules developed over time for the allocation and management of local land, vary by ethnic group. Under such rules, community authorities assign some agricultural land to individuals and manage unassigned land and resources as common community property. Customary systems often work well in the sense that they allow flexible land management while providing enough land tenure security to avoid conflict over land use. Except in areas where development projects have increased pressure on land and the need for clear documentation of land rights, surveys indicate little demand in rural areas for formal land tenure registration (World Bank 2006b; Lastarria- Cornhiel 2007; Sayalath et al. 2011). There is currently no process for registering communal land rights. These rights are either privately held by individuals, or the state regards the land as public property. Consequently, the state may lease out such land or grant it in concessions to investors, depriving the informal users of the land without paying the users for the loss of use. Although the GOL has considered formalizing communal tenure for several years, it is reluctant to deprive investors of access to these lands. There is also uncertainty as to whether fallow land should be taxed and about who should pay the taxes on communal land. And although there exist governmental decrees and instructions defining collective land and establishing rights and limitations of communal land, these have not yet been implemented. Formal state recognition and registration of communal tenure rights would protect communities from uncompensated state takings and would allow the community to prove ownership against future claims by others (Sayalath et al. 2011; Seidel et al. 2007; Andersen 2011). The state can also lease land or give land concessions to foreign individuals or organizations. Land leases and concessions are discussed in detail below (GOL Land Law 2003b; GOL 2009). As a result of the increase in land concessions to foreign investors and other government efforts, the GOL has instituted village relocation and merger programs, often as a part of the implementation of other policies. For example, under both the Village Relocation and Consolidation Program (1990–2005) and the Village Land Use Planning and Allocation Program (under which the TLUCs were issued), some remote villages were relocated, as part of an effort to more efficiently and effectively provide to these populations access to infrastructure and services such as education and healthcare. Other villages have been merged or relocated in the course of efforts to eliminate swidden agriculture and opium cultivation or to integrate ethnic minorities into Lao society. Development and investment projects, such as the Nam Theun 2 hydropower dam construction, have required village relocations as well. Though most such relocations and mergers have nominally been voluntary, the GOL has offered incentives to relocate, including promises of cultivable land, better access to facilities and a better life, while discouraging people from staying by dismantling public infrastructure. Resettlement programs impact both those being relocated and the residents of the receiving community. Involuntary relocation efforts have been poorly planned, leading to shortages of cultivable land, increased competition over land and increased conflicts over land. Resettlement also undermines the authority of customary leaders, changes livelihood strategies and disperses family groups who rely on each other for agricultural labor. Resettlement has, however, increased access to schools, health services and other infrastructure (Mann and Luangkhot 2008; GTZ 2009; GOL 2008b; Bird 2009). Under the formal law of Lao PDR, women and men have equal property rights. The Constitution guarantees equal rights regardless of gender. The Family Law and Property Law guarantee equal rights over marital property. Male and female children inherit equally under the Inheritance Law. The Land Law makes no gender distinctions. However, the public has limited knowledge of formal laws affecting women, especially in rural areas (FAO 2012a; Mann and Luangkhot 2008; Lastarria-Cornhiel 2007; GOL Constitution 2003a; GOL Land Law 2003b; GOL Family Law 1990a; GOL Law on Heritage and Basis of Inheritance 2005b; GOL Property Law 1990b). Under customary rules, property passes to women mostly through inheritance. Although customary norms vary by ethnic group, both daughters and sons can inherit land under most customary systems in Lao PDR. The majority Lao-Tai group is matrilocal, meaning that the husband moves in with his wife’s family upon marriage. Under this system, the wife more easily keeps ties with her family members, resources and support and tends to have more input in household decisions. Under this tradition, the youngest daughter must stay in her parents’ home after she is married in order to care for them in their old age. When the parents die, the youngest daughter inherits the family homestead, and any other parcels and moveable property are divided evenly among the other children. Other groups, such as the Hmong, are patrilocal and patrilineal. Upon marriage, the wife moves in with her husband’s family, and inheritance passes from father to son. Under this tradition, men control the land, and women have access to land through their husbands or male relatives. As ethnic minority groups have migrated closer to urban centers and Lao-Tai villages, they have tended to move away from patrilineal traditions. Families with small holdings often cannot divide the land equally among all their children (FAO 2012a; Lastarria-Cornhiel 2007; Mann and Luangkhot 2008). Despite both formal and customary recognition of women’s land rights, the country has been slow to issue land documents to women. As of the 1998/1999 Agricultural Census, women made up only 9% of holders of agricultural land. Although women inherited land more frequently than men, more land was titled solely in the names of men, and although half of all parcels had been acquired jointly by women with their husbands, only about 7% of parcels were documented jointly. Low levels of document issuance in the names of women have been especially prevalent in rural areas with high proportions of ethnic minorities. Women’s participation is hindered by low levels of literacy and education, limited knowledge of the Lao language and the greater role that men traditionally play at public meetings. Additionally, even where jointly issued, TLUCs only have space for one signature, and husbands usually sign. More recently, the GOL has increased efforts to include women in land rights documentation, and there are now higher numbers of land documents that include women’s names, either individually or jointly. For instance, a 2006 study of nine provinces found women’s names on about 40% of land title certificates (Lastarria-Cornhiel 2007; GOL 1999; Lestrelin et al. 2010; CEDAW 2008). Several agencies and institutions play a role in land administration in Lao PDR. The large number of actors with different mandates and priorities, the lack of communication among them, and the fact that their roles are ill-defined have combined to hamper the success of land registration efforts, especially in rural areas (GOL 2008b; Bourgoin et al. 2012). In 2011, the National Land Management Authority, the Water Resource and Environmental Administration, the Geology Department, and the Protection and Conservation divisions of the Department of Forestry merged to create the Ministry of Natural Resources and Environment (MONRE). MONRE’s programs include the following: land management (including the land-use planning and allocation program); geology and minerals; forest management; water resources and disaster risk management; and environment and climate change. MONRE is also technically in charge of approving all land concessions other than those for mining projects (REDD Desk 2011; GOL 2011; Wellmann 2012). The Ministry of Agriculture and Forestry (MAF) administers and manages all land classified as agricultural or forestry land, which composes much rural land in Lao PDR. MAF is in charge of managing all matters regarding crops, livestock, soil, irrigation, watershed management forests and protected areas. Much of MAF’s authority has devolved to Provincial Agricultural and Forestry Offices and to District Agricultural and Forestry Offices (World Bank 2005). Authority for urban planning devolved to local Urban Development and Administration Authorities (UDAAs) in the mid-1990s. Vientiane Capital, Luang Prabang, Thakhek, Savannakhet and Pakse all have UDAAs (World Bank 2005). The Ministry of Planning and Investment is the lead agency in processing land concession applications and issuing concession registration certificates to domestic business and foreign investors (Wellmann 2012). At a local level, Pho Ban or Nai Ban (village heads elected by the village population for three-year terms) and administrative committees administer land-use rights under customary law. These traditional authorities manage community land and resources, mediate land disputes and may allocate agricultural land. Village authorities sometimes keep local land records and issue Village Head Certificates on Land Ownership under informal rules (Lastarria-Cornhiel 2007; FAO 2012a; GTZ 2009). Land rights documented by a permanent land title can be bought and sold, and land sales are common in urban areas where land titles are prevalent. Lao PDR has five procedures for registering land sales. The process averages 98 days and costs about 1.1% of the property value. To register the property transfer the buyer or seller must complete the following steps: (1) obtain a Land Title Accuracy Certificate; (2) execute a sale-purchase agreement; (3) have the agreement notarized; and (4) register the transaction with the District Natural Resources and Environment Office. The office then issues a new title in the buyer’s name. The goals of the land titling program included making land markets more transparent and increasing land values. Land transactions have accelerated in Lao PDR since the land titling initiatives began (Chanthalasy et al. 2005; World Bank and IFC 2013; Mann and Luangkhot 2008). Titled land can also be leased or mortgaged. Foreigners cannot buy land but can lease it from Lao citizens or from the state for a specific period of time (between three and 75 years, depending on the type of land). Lao citizens can lease land from the state for up to 30 years. Private lease contracts must be registered with the district Lands Office. Mortgages must be notarized, certified by the village head and registered with the lands office (GOL Land Law 2003b; Chanthalasy et al. 2005). Land held under TLUCs or possessed without formal documentation cannot be legally sold, leased or mortgaged. However, informal land sales in rural areas do occur, with and without documentation. Many rural land users think of TLUCs as proof of their land rights, even if the TLUC is expired, and many exchange and sell such rights on the informal market. These sales are not recorded in any registry, and the feasibility of the transfers depends largely on the community’s willingness to participate in the land market. Informal land markets are especially active and almost entirely unregulated in resettled and merged villages due to the diminished role of traditional authorities (GOL Land Law 2003b; Chathalasy et al. 2005; Mann and Luangkhot 2008; FAO 2012a). As the result of several factors – including steady economic growth, increased demand for raw materials and a transition to cash crop production – foreign and domestic investment in large-scale industrial and agricultural products in Lao PDR has increased dramatically in the last decade, which has in turn, increased the demand for land. Investors acquire access to land through long-term state land leases, land concessions or contract farming arrangements (GTZ 2009; GOL 2008b; Baird 2011). Although lease and concession information is difficult to gather because it is scattered among various agencies and at various levels, it is clear that land concessions and leases to investors have become increasingly common: the number of land deals increased fifty-fold between 2000 and 2009. Excluding concessions for mineral exploration, logging and hydropower projects and contract farming agreements, a total of 1.1 million hectares (about 5% of Lao PDR’s total land area) have been conceded to domestic or foreign parties, involving the land of about 1900 villages. Mining concessions accounted for about half of these transfers. About 13% of those 1.1 million hectares have been conceded for agricultural projects, and about 28% for forestry. Fifteen percent of the investments in agricultural concessions are domestic, and the rest come from foreign investors, primarily investors from China, Thailand, Vietnam, Korea and India. Most agricultural concessions have been for cultivation of agro-fuels (jatropha) and rubber plantations, but also have been made for maize, sugarcane, cassava, agricultural timber products and cultivation of other cash crops (Schönweger et al. 2012; GOL 2008b; Baird 2011; Wellmann 2012; GTZ 2009; Vientiane Times 2013). Initially, the government embraced land leases and concessions because they provide valuable foreign investment, may make agricultural land more productive and help to eliminate swidden agriculture. However, government land leases and concessions also lead to loss of land held by private individuals and communities. Land concessions have been managed poorly due to several factors: the poorly defined roles of agencies and institutions involved in granting concessions; a lack of accurate information; low provincial capacity; and a lack of coordination between sectors. Authorities at different levels may authorize land concessions depending on the size of the parcel involved. District authorities approve deals involving less than three hectares; provincial authorities approve deals involving tracts of between three and 100 hectares; the central government or Prime Minister approves deals between 100 and 10,000 hectares; and only the National Assembly can approve deals larger than 10,000 hectares. However, in practice, district and provincial authorities have granted larger concessions than those allowed under the Land Law (Kenney-Lazar 2010; GTZ 2009; Wellmann 2012). Additionally, many individuals and communities have lost access to land they have used and have not received compensation either because the government does not recognize their rights or because TLUCs have expired. When compensation is paid, the process is unregulated and officials do not follow guidelines. The amount of compensation is generally set through a negotiation between the investor and the landholder; the government gets involved only if there is a dispute or disagreement. Although government guidelines require that compensation cover replacement value, rates of compensation are typically too low. Compensation may include the promise of employment, but the promised employment is often difficult and poorly paid. There is often no permanent contract for the work; and the new concession holders frequently fail to pay the promised wages. Land losers who accept employment with an investor must switch their livelihood to wage labor, which means their food security becomes tied to income security (Kenney-Lazar 2010; GTZ 2009; GOL 2008b; Wellmann 2012; Baird 2011). Environmental risks of large-scale agricultural projects include the following: encroachment on under-funded protected areas; displacement of farming communities; fragmentation of ecologically important areas; and potential risks to watersheds and river systems (GTZ 2009). The Prime Minister declared a moratorium on new economic land concessions in May 2007. The moratorium was revoked in mid-2009, then reintroduced after the National Assembly began receiving complaints from rural constituents. Despite the moratorium, concessions continue to be granted. A new four-year moratorium on land concessions to rubber plantations was announced in July 2012 (GOL 2008b; Baird 2011; Kenney-Lazar 2010; Wellmann 2012; LIWG 2012b). Agricultural investors also use contract farming arrangements in Lao PDR. Contract farming provides capital to farmers in exchange for a guaranteed share of the profits or harvest while the farmer retains rights to the land. However, it also puts farmers at risk if crops fail or do not meet the quality standards set by the investor, or if the investor does not honor the agreement. As villagers tend to be in a less favorable negotiating position than the investor, they also sometimes end up with unfair or unclear contracts. Arrangements in Lao PDR use two different models. The preferred arrangement is the so-called “2+3 model,” under which the farmer provides land and labor and the investor provides the technology, marketing and capital as a loan in return for a 70/30 split of the profits between farmer and investor. In the “1+4 model,” the farmer gives only the land, and the investor is responsible for planting and maintenance with hired labor. Then the investor gets 70% of the profits. Over 10,000 hectares in northern Lao PDR are planted under contract farming, usually under a 2+3 arrangement signed for 30–35 years (GTZ 2009; GOL 2008b). Under the 2003 Land Law, the state may only expropriate land for public interest use or public purposes. In order to carry out an expropriation, the project owner, whether it be a state entity or a private investor, must submit a Land Acquisition and Compensation Report to the concerned government authority for approval. If approved, the concerned government authority submits a request for expropriation and the land ownership documents to local authorities and the environmental agency for review and ultimate approval. Compensation must be paid prior to commencement of project construction and may include voluntary contribution, an exchange for another piece of land and/or cash payments. The criteria establishing who is eligible for compensation are unclear; some decrees include all affected persons, while others require compensation only for those with land-use rights (GOL Land Law 2003b; Ngaosrivathana and Rock 2007). Expropriation has become increasingly common in Lao PDR as land concessions have expanded due to increased investments. Budget constraints, investors’ hesitation to contribute to compensation schemes, and the channeling of funds through local authorities have all led to cutting corners in the expropriation and compensation process. When expropriations have occurred, compensation has generally been provided, though there has been little rehabilitation of livelihoods destroyed by expropriation, and compensation is sometimes limited to offers of employment (Ngaosrivathana and Rock 2007; Fujita and Phanvilay 2008). Land titling and allocation programs in Lao PDR aimed to reduce land conflicts and increase resolution of land disputes. However, land conflicts still occur in both urban and rural contexts, although the details are difficult to ascertain. The most common types of land conflict involve the following: disputes over ownership and boundaries of private land; misuse of state-managed land; inheritance disputes; disagreement over the appropriateness of (or compensation accompanying) land concessions; and disputes regarding sales, loans or mortgages of private land. Although some conflicts have arisen as a consequence of land documentation efforts, these disputes seem to be related to poor implementation of the documentation programs and lack of public awareness of the land laws and documentation processes, rather than caused by land documentation itself. In the case of urban and peri-urban areas, land titling has reduced the incidence of disputes overall (Mahaphonh et al. 2007; World Bank 2006b). Methods and avenues of land conflict resolution include the following: mediation before the Village Mediation Committee, District Justice Offices or District Court; judicial resolution through the District or Provincial People’s Courts, the prosecutor’s office or the Supreme Court; administrative resolution through the National Land Management Authority (now under MONRE); regulated legislative resolution through the Complaints Division of the National Assembly; resolution through regulated party mechanisms; or resolution through informal systems such as the Nai Ban (village head) or village administrative committee. Of these, the state prefers mediation, though the typical formal channel of resolution is the judicial system (Mahaphonh et al. 2007). Since 2010, the GOL has been engaged in reviewing and revising the legal and policy framework governing land and natural resources. In August 2012, the GOL announced a plan to develop a land policy and related land reforms that reflect a commitment to the following: protecting the rights of local communities to land; prioritizing local land management; and developing effective methods to address conflicts over land. The decision to prioritize local community rights and decentralization of land governance is another indication of the GOL’s intent to find ways of balancing the interests of local communities with the need for broader economic development, which frequently impacts access to land and natural resources and tenure security. Other efforts have included the four-year moratoriums placed on rubber and mining concessions in July 2012. The GOL has also worked with the Swiss and German development agencies to develop a database of land investments, compiling the information for tracking and monitoring and to make the information transparent and freely available. In early 2013, using this database, MONRE, along with the University of Bern in Switzerland and the German Agency for International Cooperation (GIZ), released its first national analysis on land concessions (PR Newswire 2012; LIWG 2012b; Vientiane Times 2013). Land concessions for agribusiness are one means through which the GOL has sought to achieve the following: increase agricultural productivity; bring unproductive and degraded land under production; and increase domestic and foreign investment in rural areas. By some estimates, over 1 million hectares of land have been transferred through concessions, often without complying with even the minimum legal requirements relating to size, land selection and land use. Isolated reports suggest that rather than benefiting from the concessions, local communities have lost access to land and natural resources they rely on for their livelihoods. More often than not, promised jobs and improved infrastructure have not materialized. In 2007, the Prime Minister announced a moratorium on the granting of new land concessions of over 100 hectares in order to give the GOL time to address gaps in its regulatory framework and land management strategy. The Land Issues Working Group (LIWG), a consortium of civil society groups that supports the interests of local communities, reports that the 2007 moratorium was not enforced, and a new four-year moratorium was placed on concessions for rubber plantations in 2012. Meanwhile, some provincial governments are addressing the issue of land concessions with alternative programs. In Saravan Province, for example, concessions have been granted on 19,000 hectares. The provincial government is promoting the 2+3 contract farming arrangement (described above) under which investors provide farmers with technical assistance, funding and inputs, and farmers provide the land and the labor to produce commercial crops (Hanssen 2007; Forest Carbon Asia 2012; LIWG 2012b). The Prime Minister’s 2006 Decree on Land Titling set the stage for titling of community land – both individual and communal plots – in Lao PDR. Community land titling is also an objective of the GOL’s five-year National Socio-Economic Development Plan. The plan set a target of issuing 1.5 million title deeds over the period 2011–2015. In January 2013, the GOL issued the first community land titles to five villages that had been relocated to accommodate the Nam Theun 2 hydropower project (LIWG 2012a; GOL 2010b; LIWG 2013). The US $28 million, ten-year Land Titling Project, funded by the World Bank and the Australian Agency for International Development (AusAID), concluded in 2005. The goal of the project was to strengthen the basis for long-term social and economic development by providing a system of clear and enforceable land rights and fostering development of a land market. Activities included the following: developing the legal and policy framework for land administration and management; designing and implementing a systematic titling program (sporadic titling was abandoned during implementation because of costs); developing the necessary land administration systems; and creating a land valuation system. The project focused on urban and peri-urban areas in four provinces, and included some small rice fields on the periphery of towns. The World Bank rated the project as satisfactory/moderately satisfactory. The project surveyed and adjudicated rights to 190,656 parcels, which was 95% of the revised GOL target, and issued titles for 122,934 parcels, 85% of the GOL’s target. Forty-one percent of titles were issued jointly in the name of women and men; 37% were in the name of women individually; and 21% in the name of men individually. Land transactions are increasing: during 2004–2005, 7% of the titled holdings were transferred or mortgaged, a 29% increase over the prior two years. USAID included a review of the Land Titling Program in its study of project best practices for supporting women’s land rights (World Bank 2006a; ARD 2006). During 2008–2011, with funding from AusAID, researchers from the University of Wisconsin-Madison, the National University of Laos and the University of Sydney conducted collaborative research on the impacts of land titling. The research included a qualitative survey of issues related to land titling and a quantitative survey – comparing 30 villages with titled land to 30 villages with untitled land – that measured the impact of titling on village welfare. The report of results is expected in 2013 (Mekong Research Group 2012). The Land Management and Economic Development in Rural Areas Project (2011–2017) is funded by Germany and implemented by the Ministry of Planning and Investment (MPI) with technical support from GIZ. The project plans to support registration of community and individual rural land in Luang Namtha, Sayaboury and Attapeu provinces using remote sensing and Geographic Information Systems (GIS) technology. The project follows the completion of the Land Management and Registration Project, which used a systematic process of participatory land-use planning and created a computer-based cadastral map. Germany is also supporting the collaboration between the LIWG and the GOL Department of Lands on the development of community land registration and titling programs (GIZ 2011; LIWG 2011; LIWG 2012a). USAID’s Regional Development Mission to Asia (RDMA), which manages USAID’s regional and trans-national programs in Asia, is implementing the Feed the Future (FTF) Initiative. Within the context of FTF, RDMA has designed its own regional program, which, in addition to complementing FTF focus-country programs, uniquely addresses regional issues. The Asia Regional Food Security Program seeks to expand the intra-regional food commodity trade in South and Southeast Asia in order to contribute to the broader goals of reducing regional poverty and improving food security. Activities include the following: intensification of rice production; diversification into higher-value, more nutritious products; strengthening agricultural research capacity, agribusiness marketing and value-added transformation; mitigating post-harvest loss; and addressing natural resource management issues such as soil fertility, erosion and the impacts of pesticide use. RDMA is currently seeking input into the design of model projects that provide opportunities for the exchange of learning among South and Southeast Asian countries, including Lao PDR, on agriculture and food security programs. USAID/RDMA will provide financial support for the implementation of model learning projects in support of FTF objectives (USAID 2012). Lao PDR has a tropical climate, numerous rivers (including the Mekong and its tributaries), and largely untapped groundwater reserves. In relation to its relatively small population, the country’s water resources are considered abundant. Lao PDR has the largest per capita volume of internal renewable water resources in the Asia region (190 billion cubic meters annually; 30,280 cubic meters per capita annually) (FAO 2010; World Bank 2012a). Geography and season govern the distribution of the country’s annual 1834 millimeters of rain: the higher elevations of the southern part of the country receive up to 3700 millimeters annually, while the northern valleys receive about 1300 millimeters each year. About 75% of the rain falls during the wet season (April – October), and weather extremes are relatively common. The country has experienced five severe droughts and 15 severe floods between 1970 and 2010, resulting in loss of life and damage to agriculture and fisheries. The areas most vulnerable to flooding and drought are the tropical lowland plains, which include the Mekong River Basin (FAO 2010; World Bank 2011d). The Mekong River dominates Lao PDR’s water resources. The Mekong runs from the gorges of southern China, though Burma, Lao PDR, Thailand, Cambodia and Vietnam, and empties into the South China Sea. About 1860 kilometers of the 4909-kilometer river are in Lao PDR, forming most of its western border. Ninety percent of Lao PDR is located in the Mekong River Basin, and Lao PDR’s tributaries contribute 35% to the river’s flow. The river level varies greatly between the wet and dry seasons, and the river’s annual flooding plays a vital role in the country’s maintenance of both its biodiversity and its economy. Flood-deposited sediments improve soil fertility, cleanse the water of pollutants and recharge groundwater tables. Three principal cities – Thakhek, Savannakhet and Pakse – are situated on the southern section of the Mekong, and the population along the river stores floodwater to use for dry-season irrigation. The cycle of flooding also maintains an environment that supports a substantial number and diversity of fish. Fish is the primary source of animal protein for the population, and about 70% of the country’s farmers supplement their income with fishing on a seasonal basis (MRC 2012; World Bank 2005). The Mekong River and its tributaries are among the most species-rich rivers in the world, with 456 species identified to date, including the Irrawaddy Dolphin, one of the world’s most endangered mammals. Lao PDR has several important wetlands located along the Mekong, in particular in the Siphandone region in the southern Champassack Province. Wetlands, permanent marshes and seasonally flooded forests are biologically diverse, supporting not only fish but the endangered Siamese crocodile, resident and migratory bird populations and large mammals, including Asian elephants, tigers and clouded leopards (World Bank 2005). The primary source of water in Lao PDR is surface water. 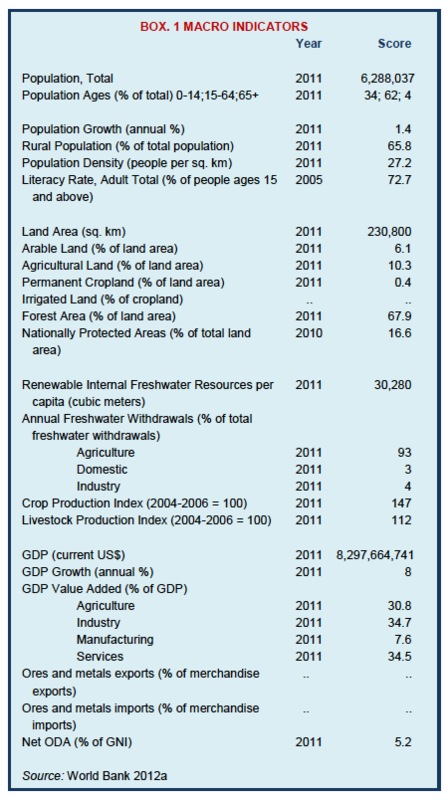 In 2011, 93% of freshwater withdrawal was for agriculture, with industrial and domestic uses at 4% and 3% respectively. The country has three different aquifer systems, and much of its groundwater is of reasonably good quality. The country’s groundwater resources are largely untapped (World Bank 2012a; FAO 2010; World Bank 2005). Expansion of irrigation is considered essential to the growth and development of the agricultural sector. Lao PDR’s irrigation potential is estimated at about 600,000 hectares. As of 2005, an estimated 271,000 hectares were irrigated in the wet season and 101,000 hectares in the dry season. Most irrigation is used for rice production, with some cultivation of vegetables in areas near markets. Irrigation systems use surface water, relying on community-managed gravity irrigation in the northern mountains and pump irrigation in the Vientiane Plain and along the Mekong River. Dry season irrigation is mainly concentrated near the major cities. Challenges to expanding irrigation include the following: pumping costs; lack of capacity for irrigation system management; and inaccessibility of markets (FAO 2010; World Bank 2005). As of 2009, 75% of the country’s urban population had access to safe water, with most of the urban water supply dependent on surface water sources. Only 40% of the rural population had access to safe water. In the lowlands, particularly in the central and southern parts of the country, groundwater is tapped for drinking. Historically, water quality has been good. However, rapid urban growth (which is outpacing infrastructure development), commercial and industrial development and ineffective controls over discharge are combining to pollute water sources in some areas. Urban sanitation system coverage has grown to 86% of urban households, but systems are often poorly maintained or otherwise unable to meet demand. Only 38% of the rural population has access to sanitation facilities; most people use fields, marshes and water courses for human waste disposal. Some water sources are contaminated, and dysentery, cholera and typhoid are common where people use streams for drinking, bathing and washing (FAO 2010; World Bank 2005). Lao PDR has significant potential for hydropower development, estimated at 23,000–30,000 megawatts. Of this total, about 18,000 megawatts may be technically exploitable. In 2009, Lao PDR’s total dam capacity was about 7.8 cubic kilometers, with 21 additional hydropower projects in planning stages. The largest project, which was decades in the planning, is the US $1.3 billion Nam Theun 2 Hydropower project (NT2), which came online in April 2010. The project straddles Khammouane and Bolikhamxay provinces in central Lao PDR and diverts water from the Nam Theun River to the Xe Bang Fei River, generating 1070 megawatts from a 350-meter (1148-foot) elevation drop. The reservoir occupies about 440 square kilometers and has 3.5 cubic kilometers capacity. The GOL has a majority interest in the Nam Theun 2 Power Company, which owns and manages the project. NT2 was built in the face of significant resistance, primarily from international environmental groups such as International Rivers. Within other international development circles, NT2’s achievements in the area of environmental and socioeconomic management are considered models for a new generation of large infrastructure project planning and development (NTPC 2012; FAO 2010). The 1996 Law on Water and Water Resources (Water Law), provides that water and water resources are the property of the national community, which the state represents in managing the resource. The state shall exercise its authority in a manner that does the following: preserves sustainable water and water resources; ensures water volume and quality necessary to meet the people’s basic needs; promotes agriculture, forestry and industry; and ensures that no damage is caused to the environment. The law includes numerous requirements designed to protect the environment and safeguard water quality while supporting socioeconomic uses of water and water resources. The highest level of restrictions is imposed on water in protected areas (GOL Law on Water and Water Resources 1996). The Water Law classifies water use as small-scale, medium-scale and large-scale. Individuals, households and groups can engage in small-scale use, defined to include household-level, non-business use, without government permission. Medium- and large-scale use, including water withdrawal and construction of water infrastructure for businesses use, require registration and government approval. Large-scale use, including development activities such as digging and construction, requires submission of feasibility studies and social impact assessments and plans (GOL Law on Water and Water Resources 1996). The Water Law is implemented under the 2001 Decree on the Implementation of the Water and Water Resources Law, which articulates the roles of various ministries, agencies and local government bodies regarding water and water resources. The 1998 Water Sector Strategy and Action Plan and the 2000 Policy on Water and Water Resources provide for the management, exploitation, use and development of water resources in a manner that is sustainable, equitable and consistent with the twin and often competing goals of socioeconomic development and environmental protection. Other laws and regulations governing the country’s water resources include the 2003 Drinking Water Standard and the 2001 Hygiene and Disease Prevention Law. Regulations issued under the Agriculture Law govern Water User Associations and irrigation (Komany 2010; WEPA 2012a). Decree No. 293/PM on the Establishment and Activities of the River Basin Committees (2010) establishes an intergovernmental and multi-sectoral body to sustainably manage the priority river basins and sub-basins of the country (Boualapha and Philavong 2011). Lao PDR is a member of the Mekong River Commission (MRC) and party to the 1995 Agreement on the Cooperation for the Sustainable Development of the Mekong River Basin. The MRC Initiative on Sustainable Hydropower specifically focuses on advancing regional cooperation for the sustainable management of the growing number of hydropower projects within a basin-wide perspective. The initiative aims to construct and maintain knowledge platforms and networks enabling MRC countries to routinely exchange information, share experiences and collaborate on tools and practices that deliver sustainable outcomes (MRC 2010). The development of hydropower and mineral resources has significant impact on land and water resources relied on by local communities in Lao PDR. The Water Law codifies some general principles regarding management of competing uses. For example, those who possess land upstream have the right to block the regular flow of water even if the blockage will negatively impact downstream users, but the upstream users must compensate downstream users for the loss or damage caused. Similarly, if actions of a downstream user damage the possessor of upstream land, such as through erection of a dam, the upstream user must be compensated (GOL Law on Water and Water Resources 1996). Lao PDR’s experience with the development of NT2 required attention to competing rights to natural resources and highlighted the gaps in the legal framework and areas of disharmony between rights arising under the Water Law and rights arising under laws governing land and agriculture. In the case of NT2, project documents were drafted to address areas of ambiguity, and programs were designed to compensate local communities for damage and dislocation (NTPC 2012). Water resources in Lao PDR are governed by numerous ministries and agencies, some of which hold overlapping mandates and authority. The Water Resources Coordination Committee, which was established in 1997, operates within the Office of the Prime Minister and advises the government on matters of water policy, management and planning. The committee is responsible for integrating water resource management into the country’s socioeconomic development process and ensuring that appropriate planning, management, follow-up, inspection and protection capacity are provided for water resources and investments. The committee includes representatives from relevant miniseries (Komany 2010; WEPA 2012b). The Ministry of Agriculture and Forestry (MAF) is responsible for irrigation and water resource issues broadly relating to agriculture, fisheries and forestry. The Integrated Watershed Management Unit and the Department of Irrigation are within MAF. The Ministry of Communication, Transport, Post and Construction has responsibility for urban water supplies and inland waterways, and the Ministry of Energy and Mines has authority over hydropower and water resource uses related to mining. The Ministry of Health is responsible for the safety of drinking water (Komany 2010). Lao PDR is a member of the Mekong River Commission. The MRC, which was originally conceived as the UN-created Mekong Committee, is governed by the 1995 Mekong Agreement. With the signing of the 1995 Agreement, the member countries (Cambodia, Lao PDR, Thailand and Vietnam) expressed a commitment to sustainable development and management of natural resources. The MRC has played a large role in helping to ensure that hydroelectric projects are developed with attention to sustainability of river resources (World Bank 2005; FAO 2010; MRC 2012). The Lao National Mekong Committee (LNMC) is responsible for coordination with the MRC and supervising the planning and the management of river basins in Lao PDR consistent with the Mekong Agreement and the MRC’s plans and strategies. The LNMC serves as the national water-resources apex body with relation to water issues affecting jurisdiction of the MRC. The LNMC oversees River Basin Committees (RBCs), which are the water resources executives responsible for the management, development, conservation, rehabilitation and utilization of water resources in the river basin. RBCs are responsible for several tasks: (1) supplying sustainable water resources to water sectors through systematic planning and implementation; (2) reducing socioeconomic and environmental impact from water related disasters; (3) managing water quality; (4) improving livelihoods; and (5) contributing to the national socioeconomic development plan (Boualapha and Philavong 2011). The Water Resources and Environment Administration (WREA), established in 2007, is responsible for management of water resources. WREA merged with portions of the National Land Management Authority and the Protection and Conservation Divisions of the Department of Forestry to create the Ministry of Natural Resource and Environment (MONRE) in 2011. MONRE’s water-related duties include the following: reviewing and updating the water resources policies, strategies and laws; developing water resources management tools; implementing an integrated water resources management system; and managing the disaster risk program (Boualapha and Philavong 2011; REDD Desk 2011; GOL 2011). The Department of Housing and Urban Planning (DHUP) of the Ministry of Communication, Transport, Post and Construction has management and investment oversight for urban water supply. Nam Papa is the state-owned provider of urban water and is governed at the provincial level. DHUP has the duty to periodically review the policy and strategy of Nam Papa, including standards of customer service and priorities for urban water supply development. In 1999, the Water Supply Authority was established to oversee the sector. The Ministry of Public Health’s National Centre for Environmental Health and Water Supply (Nam Saat) is responsible for rural water supply (World Bank 2005; Komany 2010). Over the last decade, the GOL has concentrated on three efforts in the water sector: (1) the development of hydropower; (2) continued expansion of irrigation systems; and (3) increasing access to drinking water. The GOL adopted the National Policy on Environmental and Social Sustainability of the Hydropower Sector in 2005. The policy is an effort to anticipate some of the risks and cumulative impact of hydropower development in the country and apply some of the experience of the NT2 construction more broadly. The policy does the following: sets out the requirements for environmental impact assessments that take cumulative impacts into account; requires consultation with affected people; and stipulates watershed management and conservation offsets for unavoidable ecosystem impacts. The policy also directs use of project revenues and requires monitoring and public disclosure (World Bank 2005). The GOL has invested in a variety of irrigation projects in the last decade: community-managed irrigation schemes; pump irrigation systems; extension training for farmers; and irrigation-ecosystem management systems. Some GOL projects include local engagement of the private sector in the provision of public services, such as rural water supply. For example, in Ban Saphai Neua, Champasack Province, district officials granted a private operator a ten-year license to supply water to 200 households. The private operator surveyed the communities to assess demand and set rates, which were approved by the local government. Similarly, as a component of the Provincial Infrastructure Project in Oudomxay and Phongsaly Provinces, a Nam Saat program, Hygiene Awareness, Sanitation and Water Supply (HASWAS), helps provincial offices engage the private sector for supply and construction of water supply and sanitation infrastructure in villages (World Bank 2005). In 2010 the MRC adopted the Integrated Water Resources Management-Based Basin Development Strategy for the Lower Mekong Basin (IWRM Strategy). The IWRM Strategy requires three steps: (1) identification of strategic priorities to optimize the development opportunities and minimize uncertainty and risks; (2) agreement on and prioritization of basin-wide environmental and social objectives and baseline indicators to apply to future developments; and (3) understanding of the importance of strengthened basin management and a program for institutional, technical, organizational and human resource capacity-building. The MRC’s strategic plan for the 2011–2015 period supports the implementation of the IWRM Strategy and a platform for the MRC’s plan to decentralize core functions of the MRC Secretariat to the national level of Lao PDR and other MRC member states (MRC 2012; Boualapha and Philavong 2011). In order to minimize the risk of loss of life and economic resources from floods and other natural disasters, the National Disaster Management Office has drafted Lao PDR’s first national disaster management plan for 2012–2015. The plan formalizes a cross-sector governmental approach to disaster preparedness, mitigation and response. The plan was drafted with technical assistance from the United Nations Development Programme and the World Bank (IRIN 2011). Numerous donors, including the Asian Development Bank (ADB) and the World Bank, have invested roughly US $120 million in the development of a series of environmental and social mitigation programs designed around the NT2 project and covering the entire development footprint from the Vietnamese border to the Mekong River. The projects include the creation of new protected and conservation areas and corridors. Biodiversity studies have been conducted and ecological plans created to protect the region’s biodiversity. The programs have included projects supporting the livelihoods of resettled and downstream communities. The entire program will be adaptively managed and subject to multiple layers of internal and external monitoring (NTPC 2012; ADB 2008; World Bank 2005). The four-year, US $8 million Technical Assistance for Capacity Development in Hydropower and Mining Sector Project (2010–2014) is funded by the World Bank. The project aims to increase human capacity and improve the performance of Government oversight institutions for the hydropower and mining sectors. The activities related to hydropower include a joint hydropower and mining learning program to build capacity of government staff and generate public awareness across the hydropower and mining sectors. The hydropower component aims at capacity-building covering the entire value chain, from planning, concessioning, construction and operation to revenue management (World Bank 2012b). USAID supported the development of the Rapid Basin-Wide Hydropower Sustainability Assessment Tool (RSAT). The tool helps identify the most sustainable sites, designs and operational rules for hydropower development in the Lower Mekong River Basin. The tool was a product of a partnership initiative, the Environmental Considerations for Sustainable Hydropower Development (ECSHD), which was formed in 2006 by ADB, MRC and the World Wide Fund for Nature. RSAT is the outcome of collaboration between the ECSHD partners and USAID’s Environmental Cooperation-Asia project (USAID et al. 2010; MRC 2012). In 2012, the Swedish government committed US $8.5 million to the MRC to strengthen its management and development of water and related resources, and the Government of Finland committed an EU €11 million grant to broaden its support of sustainable hydropower development through widening stakeholder engagement in addition to other existing activities. The funds will assist the MRC in further incorporating sustainability considerations into hydropower development planning (MRC 2012). Several donors, including ADB, have supported Lao PDR’s development of irrigation for decades. One long-running project was the US $24 million Community-Managed Irrigation Sector Project (1997– 2004), which was funded by ADB. The project sought to improve food security in the central mountainous regions through a variety of activities: helping communities to organize themselves to participate in the selection, design, implementation, operation and maintenance of irrigation systems; and providing parallel development, such as constructing rural access roads and capacity-building in environmental monitoring and watershed protection. The project constructed 47 irrigation schemes, created 47 Water User Associations and provided potential for improved irrigation services to 3845 hectares utilized by about 3470 households. Costs of irrigation development were higher than anticipated, resulting in the construction of fewer systems, and utilization of irrigation remains below potential. Some land failed to be put into production due to lack of resources, and in some areas, farmers were unwilling to join the Water User Association or pay fees for irrigation services they considered unreliable or inadequate (ADB 2006). Other projects have included development and rehabilitation of irrigation systems as part of broader programs. For example, the US $10 million Upland Food Security Improvement Project (2010–2014), which is supported by the World Bank, is designed to improve food security for rural households in upland areas by supporting improved rice-based farming systems. The mid-term review reported achievements in rehabilitating small-scale irrigation systems covering roughly 3800 hectares. Similarly, the Khammouane Development Project (2008–2016), which is designed to strengthen the planning process and public financial management associated with the decentralized delivery of public services and infrastructure, approved an additional US $8.2 million to develop irrigation along the NT2 downstream channel and the lower Xe Bang Fai River and sharpen its pro-poor focus. The project will use discharge from the NT2 dam for irrigation and will rehabilitate existing irrigation facilities (World Bank 2012c; World Bank 2011a). USAID is supporting the Water, Sanitation and Hygiene Enterprise (WaterSHED) program with US $8.5 million over five years. WaterSHED is a public-private partnership led by the University of North Carolina and designed to bring affordable water and sanitation products to market in Lao PDR, Cambodia and Vietnam. In Lao PDR, the program helped launch a factory that manufactures ceramic water filters. Project partner Lao Water Resources, Inc. sells the inexpensive household water filtration system. As of May 2012, the filters have provided safe water to more than 42,000 people (USAID 2012). Sixty-eight percent of Lao PDR’s land is classified as forest, including the 16.6% of total land classified as protected area. Approximately 20–40% of the country’s forestland is considered degraded; only about one-half of land classified as forest has more than 20% crown closure. The dominant type of forest is mixed deciduous forest, with the largest areas of undisturbed forest located in the central and southern regions of the country. The north has areas of both dry and tropical montane evergreens, and the Annamite Mountains on the border with Vietnam have high-quality pines and evergreens. Low-elevation forestland is generally covered in grasses and herbs, with widely spaced deciduous trees. The Mekong Valley has numerous small plantations of teak, rosewood and black trees, which were originally planted in the 1960s to secure watersheds and prevent flooding (World Bank 2012a; Tong 2009; World Bank 2005). Lao PDR’s forests are among the most biodiverse in Southeast Asia, with an estimated 1140 animal and plant species represented, 319 of which have national or global conservation significance because of their limited numbers and range. The forests have the highest number of large mammals in Southeast Asia, including the Javan rhinoceros and one of the most endangered animals in the world, the kouprey (a wild ox) (World Bank 2005). Wood accounts for 35% of the country’s total export revenue. The country has 125–150 small capacity sawmills that exploit kering and mersawa as commercial species. Most logging is done in Klammouane and Savannakhat provinces. Forests also supply fuel wood, which accounts for 80% of domestic energy consumption. Non-timber forest products (NTFP) are a crucial source of food security for the population, especially in times when rice yields are low. Forests provide fish, wildlife, greens, bamboo shoots and medicinal herbs. Brisk trade in NTFPs is conducted year-round, and sales of forest products such as turpentine, rosin, honey, wax, cardamom and rattan provide an average of 55% of rural household income (World Bank 2005). Between 1990 and 2010, Lao PDR lost about 9% of its forest. The annual rate of deforestation was approximately 0.5% during 2000–2010. In addition to the loss of forestland, the quality of the existing forest has deteriorated, with dense forest area decreasing from 29% of total forest area in 1992 to 8% in 2005, and open forest increasing from 16% to 26% of total forest area over the same period. Over past decades, forest fragmentation has also increased, with small forest patches (less than 10 hectares) rising from about 1% to almost 7% of the total forest area between 1992 and 2005. Large forest compartments (larger than 1000 hectares) fell from 88% of total forest area to 54% over the same period (World Bank 2012a; Tong 2009; Mongabay 2006). The main drivers of deforestation and forest degradation in Lao PDR are the following: (1) conversion to agricultural land and plantation crops (including timber trees and rubber), both by commercial companies and smallholders; (2) use of forest for development of mining and infrastructure; (3) fire; and (4) unsustainable wood extraction, especially illegal logging. Illegal logging is fueled by high demand for timber; weak monitoring, law enforcement and control; good accessibility; and insufficient local awareness of laws protecting forests (GOL 2010a). Large and medium-size investment in agricultural cash-crop cultivation and industrial tree plantations has grown substantially during recent years, and land acquisition for agribusiness threatens Lao PDR’s forests. Maps used by the GOL and investors to select land for development can incorrectly classify fallow land and village forestland as degraded or unstocked and thus available for development. The required participation of village representatives in the process of selecting land and verifying its condition – a process intended to protect against inappropriate land classifications and transfers – occurs haphazardly, if at all. In response to concerns raised by international and national groups, the Prime Minister imposed a land concession moratorium beginning in 2007. The moratorium on land concessions has not been observed in all cases (GOL 2010a; GOL 2008b). The 2007 Forestry Law governs Lao PDR’s forests and sets forth the basic principles and guidance on sustainable management, preservation, development, utilization and inspection of forest resources and forestland. The policy framework underlying the Forestry Law attempts to strike a balance by promoting sustainable forest use as a means to socioeconomic development, while also protecting forestland and resources and encouraging rehabilitation of forests through regeneration and tree planting (GOL Forestry Law 2007). Protection Forests, created to prevent soil erosion and to protect soil quality and water resources. Conservation Forests, created to preserve biodiversity, forest ecosystems and other valuable sites of natural, historical and cultural significance. Production Forests, natural and planted forests classified for use by wood and forest-product businesses to satisfy the requirements of national socioeconomic development and livelihoods. The GOL grants rights to use the forest and forest resources. The right granted depends on the forest classification, the identity of the user and the intended use (e.g., household use, public benefit, customary use or business operation). For example, the law permits local use of non-prohibited timber species from a village forest for the construction and repair of houses, provided that the user obtains approval from the village administration authority and permission from District or Municipal Agriculture and Forestry Office. Logging and harvesting of forest products is permitted only in Production Forest areas where inventory, surveys and sustainable management plans have been completed, and only in the areas where the GOL allows construction of infrastructure related to timber harvesting (GOL Forestry Law 2007). Customary utilization of forests is recognized under the Forestry Law, and village forests are established to allow the harvesting of timber and other forest products for household use. Rights to use natural forests, planted forests and forestland areas can be allocated by the state to village administration authorities for long-term sustainable use according to a management plan. The Forestry Law also encourages individuals, households and organizations to engage in forest regeneration and tree-planting activities in degraded and barren forest areas through the provision of various incentives. The law grants ownership rights to trees planted by people or organizations (so long as they use their own labor and funds), and various tax credits and exemptions are available (GOL Forestry Law 2007). Decree No. 59/PM on Sustainable Management of Production Forest (2002) provides for the establishment and management of Production Forests. The decree emphasizes the participation of local communities in the planning, management and sale of timber in accordance with agreements between local forest authorities and villages (Tong 2009). The 1999 Environmental Protection Law, supported by its Implementing Decree (2002), is the country’s principal environmental legislation. The law includes measures for the protection, mitigation and restoration of the environment, as well as guidelines for environmental management and monitoring (World Bank 2005). Lao PDR recognizes a range of forest-resource tenure rights: rights to use state-managed forestland; customary use rights; communal use rights; leases and concessions held by private entities; and open access. Rights to access forestland and use forest resources are often not clearly delineated and may overlap. Analysis of Lao PDR’s legal framework governing forests for purposes of REDD+ programming has highlighted the tension between customary rights exercised by local communities and formal rights held or sought by commercial entities seeking to exploit natural resources, including carbon. Forest officials at district and provincial levels, who are primarily responsible for determining land classification and conducting due diligence necessary for land concessions, often lack knowledge of customary forest rights, leaving customary users vulnerable to loss of access and use rights when land transfers occur by concession or lease (GOL 2010a). The Forestry Law recognizes customary use rights of villages based on their tradition of using those natural resources that are available within the village boundary. Customary use rights are applied case-by-case for each forest category. Local communities generally have the right to use five cubic meters of timber per household for housing, and the right to collect, use and sell NTFPs. The law also allows local communities to hunt non-protected wildlife species and use degraded forest for agriculture and grazing. Local authorities, together with district forest officials, can allocate land and degraded forest lands within the village boundary to individuals and organizations for different purposes, such as for conversion into rice paddies, planting trees, cultivating upland crops and livestock grazing (GOL Forestry Law 2007; Manivong and Sophathilath 2007). Attention to local community interests in the management of forestland began in the late 1980s, and at various times since then, international NGOs and donors have worked with the GOL to integrate community forestry principles into the national forestry management system. In the 1990s the GOL established a Community Forest Support Unit within the Department of Forestry, but the unit did not survive beyond the late 1990s. In the 1990s, the concept of “village forestry,” a term used to describe processes that engage local communities in forestry, and the Land Use Planning and Land Allocation policy, which recognizes the rights of local people to manage village forests, were introduced into GOL forest strategies. Much of the community-based forest management efforts since that time have taken place within this framework (Phanthanousay 2005; Hackman and Bounphasy 2009). In 2006, the Prime Minister issued Decree No. 88 on Land Titling, which set the stage for issuing communal land titles to village forest land allocated by the GOL to village communities. The development of community land titles is also among the objectives of the five-year National Socio- Economic Development Plan, which aims to issue 1.5 million titles in the period 2011–2015. Several donors have been working with the GOL and local communities to demarcate and register communal forest land (LIWG 2011; GOL 2010b). The Ministry of Agriculture and Forestry (MAF) has primary authority to manage Lao PDR’s forests. MAF is responsible for the following: establishing forest policy and setting targets; formulating strategies and the legal framework to support application of forest policy; and supporting conditions for sustainable forest management and use. MAF has overall responsibility for the classification and conversion of forestland. National-level departments include the Department of Forestry, which focuses on policy development and legislation, as well as monitoring and evaluation at the macro level, and the National Agriculture and Forestry Extension Service and Forestry Research Institute, which are involved in the testing and implementation of policies at the local level (Manivong and Sophathilath 2007; World Bank 2005). The Forest and Forestland Inspection Organization (FFIO) – also known as the Forest and Forestland Management Organization – serves as secretariat to MAF. FFIO reviews the implementation of laws and regulations related to forests and inspects forest-related activities and projects, including the operation of businesses that deal in forest products. At the local level, Forest Officers (ultimately reporting to FFIO) conduct patrols and on-site inspections, record findings and inspection results and provide support for criminal cases (Manivong and Sophathilath 2007; World Bank 2005). The Provincial Agriculture and Forestry Office (PAFO) is responsible for the following: elaborating and implementing policies and strategies related to the management and use of forests and forest resources within its jurisdiction; disseminating forestry laws and regulations; providing guidance; monitoring and evaluating the implementation of forestry activities; managing national protected areas and implementation of sustainable management of production forest areas; and monitoring the implementation of forest management. PAFO also issues permits for logging and harvesting NTFPs according to the notice of the Ministry of Agriculture and Forestry. The District Agriculture and Forestry Extension Office (DAFEO) is responsible for forest inventory and planning, harvesting and sale of forest products, and working with village authorities and Village Forest Associations to implement forest management plans (Manivong and Sophathilath 2007; World Bank 2005). At the village level, Village Forest Units (VFUs) work with DAFEO on several tasks: organizing villagers’ participation in the management, preservation and use of forests, NTFPs and other forest resources; monitoring forest change, as well as the environment and forestry activities within the village; reporting to the District or Municipal Agriculture and Forestry Office; and leading inspection activities. Village authorities have the power to establish rules governing the village forests, so long as the rules are consistent with the Forestry Law. Village Forest Associations (VFAs) have legal personality under the Forestry Law. VFAs sometimes overlap with VFUs or may operate separately. VFAs negotiate with DAFEO to develop village forest management plans and contract with DAFEO manage production forests (Manivong and Sophathilath 2007; World Bank 2005). The Forestry Strategy 2020 is an effort by the GOL to accomplish the following: assess Lao PDR’s forest resources; identify forest-related issues; assign priorities for action; and establish an overarching strategy. The Forestry Strategy promotes GOL collaboration with domestic and international entities and donors in various areas: plantation development; wood processing; NTFPs; forest resource conservation; and ecotourism. The Forestry Strategy has four major targets for the forestry sector: (1) to improve the quality of forestland through regeneration of up to 6 million hectares and planting up to 500,000 hectares of unstocked forest area; (2) to contribute to livelihoods, fiscal revenue and foreign exchange earnings by providing a sustainable flow of forest products for domestic consumption and household income; (3) to preserve the country’s biodiversity; and (4) to conserve the environment through programs for the protection of soil and watersheds. Toward these goals, the GOL has taken the following steps: establishing National Conservation Forests and National Production Forest Areas where sustainable management is being practiced and timber originating from these areas can be “certified;” creating a National Biodiversity Strategy and Action Plan; and approving a decree governing Protection Forests. The Production Areas – initially 500,000 hectares but projected to expand – are managed by local communities under agreements with the local government. The agreements include negotiated benefit-sharing arrangements (World Bank 2005; GOL 2010a). The GOL has also made a significant investment of time and resources in the development of a plan for REDD+ under the Forest Carbon Partnership Facility (FCPF) and UN-REDD. Lao PDR was selected as a Forest Investment Program (FIP) pilot country in June 2010, and an investment plan was developed and endorsed by the FIP sub-committee in 2012. With the support of international donors, the GOL has developed its Readiness Preparation Proposal, which was submitted to the FCPF Secretariat in 2011. The grant is expected in 2013. A large number of cross-sector and related programs have been generated by Lao PDR’s engagement with REDD+. For example, studies are underway to determine how to address the carbon emissions generated through land clearing for the development of hydropower and mining, and the conversion of forestland for agricultural concessions (FCPF 2012; GOL 2010a). The GOL created the Department of Forest Inspection (DOFI) within MAF to improve law enforcement in forest-related activities, including illegal logging, and to improve monitoring and governance in the sector. To date, the department has lacked the funding and capacity necessary to undertake the tasks, especially at the provincial and district levels. DOFI’s five-year plan for 2011–2015 includes measures to improve performance as more staff are employed and trained. The REDD+ strategic options for dealing with illegal logging will be undertaken in support of DOFI’s five-year plan (GOL 2010a). In an effort to address deforestation and degradation of forestland, the GOL established a National Land Management Authority (LMA) in the Prime Minister’s Office. The LMA is charged with conducting land-use planning at the national and provincial levels and to provide support to districts and villages for planning at their respective levels. The LMA created a Participatory Land-Use Planning Manual for use by local authorities at the village level. Resolution of land conflicts, land-use planning and land titling has been conducted in about 1000 villages in 16 of the poorest districts. The Department of Forestry has been identifying and demarcating areas of Protection Forest, Conservation Forest and Production Forest (GOL 2010a). About 14% of the area of Production Forest is being managed in accordance with Forest Stewardship Council principles for sustainable forest management with the support of the World Bank-funded Sustainable Forestry Development (SUFORD) project. The Department of Forestry will apply these principles to the remainder of the 3.1 million hectares of Production Forest Areas in the coming years. The experience from SUFORD is that the introduction of sustainable forest management results in a reduction of emissions, the delineation of forest boundaries and the participation of local communities in forest protection. The national plan for REDD+ has an objective of reducing carbon emissions by extending community participation and sustainable forest management principles to all production forests (GOL 2010a). The GOL has been encouraging the engagement of the private sector in commercial forest plantation as a means of increasing forest cover while also contributing to the local community. The benefits can include improved infrastructure and employment or contract farming agreements, but no regulatory framework requires any such benefit-sharing or engagement with the local economy, and there is no targeted oversight of plantations operated by private enterprises. Private companies currently engaged in commercial forest projects include: Bouarapha Group; Oji Paper Company of Japan, which purchased BGA Lao Plantation Ltd. (about 40,000 hectares in Khammouane and Bolikhamxay provinces); Phoenix Pulp and Paper Company of Thailand (12,000 hectares in Savannakhet province); Advance Agro Pulp and Paper, Ltd. of Thailand (20,000 hectares in Savannakhet province); and Aditya Birla Group of India’s Pulp and Fiber Business (50,000 hectares) (Manivong and Sophathilath 2007). In separate projects, SNV Netherlands Development Organisation and GIZ worked with local forest and GOL officials to assist local communities in obtaining communal title to forestland. In Sangthong district, Greater Vientiane Capital City Area, with the assistance of SNV, four villages engaged in participatory mapping of communal forest land. In 2011, these villages were issued the first communal forestland titles. GIZ’s Land Management and Economic Development in Rural Areas Project (2011–2017), which is a follow-on project to its Land Management and Registration Project, includes mapping and registration of communal forestland (LIWG 2011; GIZ 2011; Sayalath et al. 2011). Most community forest programs supported by international donors focus on forest protection and livelihoods support rather than on sustainable timber programs. Examples of such programs are: the Lao- Swedish Forestry Programme – Joint Forest Management in Savannakhet Province; the German-supported Rural Development in Mountainous Areas Project in the north of Lao PDR; the World Bank/Finland-supported Forest Management and Conservation Project (Village Forestry) in Savannakhet and Khammouane Provinces; and the World Bank-funded Sustainable Forestry Development Project (SUFORD), which is operating in four southern Lao provinces, with plans to expand into other provinces. Other projects include the Japanese International Cooperation Agency’s Forest Conservation and Reforestation Project in Luang Prabang Province and the World Wide Fund for Nature’s Xekong Sustainable Forestry Project. These initiatives and efforts have introduced various models for community participation and management of forest resources, benefit-sharing of timber royalties and transparency in forest management (Phanthanousay 2005). Through the Swedish International Development Cooperation Agency (SIDA), the Government of Sweden has supported Lao PDR’s forestry sector for more than 30 years. SIDA provided financial and technical support in developing and testing a joint forest management system in Dong Kapho State Production Forest in Savannakhet province. SIDA supports forestry research through the Lao-Swedish Upland Agriculture and Forestry Research Project, which is under the National Agriculture and Forestry Research Institute. Among other topics, the project is searching for the best models for scalable community-based forest management (Manivong and Sophathilath 2007). The FAO-Netherlands Partnership Programme (2006–2007) aimed to enhance food security through sustainable use of NTFPs. Project activities were aimed at both policy makers and local communities. The Partnership Programme aimed to demonstrate to policy makers: the importance of NTFP biodiversity for food security and poverty alleviation; the need to integrate the NTFPs into forest management planning to ensure rural communities’ long-term access to food; and the usefulness of the Market Analysis and Development (MA&D) approach. In local communities, the project aimed to demonstrate the importance of NTFP biodiversity in regards to socioeconomic development. The project was implemented in Savannakhet province and applied an MA&D approach to conduct an assessment of the impact of forest conversion on food security and work with villages to develop NTFP management plans. The project achieved the following: the integration of NTFP into forest management plans for food security and sustainable socioeconomic development of the villages; better understanding of existing NTFPs relevance to food security and sustainable livelihoods; and better understanding of human management of and economic markets for NTFPs (FAO 2011). ADB supports the National Agriculture and Forestry Extension Service-operated Industrial Tree Plantation Project. The project works with smallholder family groups and forest plantation enterprises to plant fast-growing exotic tree species for industrial purposes. The project began ten years ago in Vientiane Capital and Vientiane, Bolikhamxay, Khammuane, Savannakhet, Saravane and Champasack provinces. In addition, ADB has also assisted the forestry sector of Lao PDR through a technical assistance project entitled Poverty Reduction in Upland Communities through Improved Community and Industrial Forestry (Manivong and Sophathilath 2007). Lao PDR is located within the Greater Mekong Sub-Region, which has numerous geological belts and a wide variety of metallic and non-metallic minerals, including gold, silver, lead, zinc, tin, coal, potash, rock aggregate and gemstones. Confirmed deposits of mineral resources are not large by international standards, but they are significant relative to the overall size of Lao PDR’s economy. Exported mineral commodities include gold, copper, tin, lead, zinc, gypsum, coal, industrial minerals and construction materials. As the country has begun medium- and large-scale mining operations and commodity prices have risen, the country’s mineral resources have played an increasingly important role in Lao PDR’s economy. In 2010, the minerals sector accounted for 8% of GDP, about half of the country’s exports and 10% of state revenues (GOL 2012; Phommakaysone and Homsombath 2012; Boungnaphalom 2010; Fong-Sam 2012). While geological surveying and mapping have increased in the last decade, accurate information about the extent of mineral reserves in Lao PDR has been limited. Based on completed surveys, copper reserves are currently estimated at 162 million tons, followed by tin (38 million tons), gold (32 million tons) and iron ore (26 million tons). The primary gold reserves have been found in the southern part of the country, east of Savannakhat and in the central area. Copper deposits are found in the northern and far southern regions, and lead-zinc in Vientiane province. Other minerals, including smaller deposits of gold and copper, occur throughout the country (GOL 2012; Phommakaysone and Homsombath 2012; Boungnaphalom 2010). Historically, most mining in Lao PDR was small-scale, with artisanal operations dating back to the colonial era. Small operations continue to work lignite, tin, zinc, gold and sapphire deposits and often concentrate on alluvial mining. In 2002, commercial mining of copper and gold began on a larger scale with the construction of the Sepon mine in southern Lao PDR. The steady rise in the price of gold has particularly benefited this sector. The Sepon mine is owned by an Australian-managed subsidiary of China Minmetals Corporation of China, with the GOL holding a 10% share. A second large privately owned copper mine was established in central Lao PDR in 2008 by Phu Bia Mining Ltd., the local subsidiary of the Australian-listed PanAust Ltd. The Department of Geology and Mineral Resources (of the Ministry of Energy and Mines) lists an additional fifty domestic and foreign companies engaged in mineral exploration, prospecting and exploitation in the country, with roughly 270 projects ongoing. China is the largest foreign investor, followed by Vietnam and Thailand (ICMM 2011; GOL 2012; Boungnaphalom 2010; Larsen 2008). Small-scale and artisanal mining. Most domestic operators (private and state-owned) work as small-scale and artisanal miners and in quarries. In particular, artisanal alluvial mining, especially gold panning, has increased with the price of gold and is estimated to be producing between US $8 and US $25 million annually. Rural residents, over 75% of whom are women, engage in artisanal mining on a part-time and seasonal basis to supplement agricultural income (Larsen 2008). Small- and medium-scale mining. Small to medium-scale operations, which are commonly partnerships of national and regional companies, target exploitation of confirmed deposits to limit capital expenditures. Technologies employed tend to be relatively simple and rely on manual labor. The operations have increased opportunities for local labor, although some companies have exported workers from China and Vietnam. Local processing is often limited; raw ore and preliminary concentrates are often shipped across the border for further processing in neighboring countries (Larsen 2008). Large-scale mining. Large-scale mine operators are primarily mid-size companies from Australia, Europe and North America, with increasing participation of regional corporations. Although the number of companies engaged in exploration continues to grow, the sector is dominated by the gold and copper mining operations of the two largest mining operations, MMG Sepon and PBM, which together account for roughly 90% of total production (Larsen 2008). Oversight and monitoring of the mining sector is currently quite limited. Artisanal and small-scale operations often fail to meet safety and environmental standards. Chemicals are often not appropriately handled, and little is done to minimize the negative effect of mining on both the environment and local population. Contracts with small and medium-sized operations tend to be negotiated at local levels and are not subject to review for compliance with legal standards. The two largest mining operations – MMG Sepon and PBM – report significant efforts at local job creation and benefit-sharing with affected communities, but independent verification of such efforts is limited. Contracts with small and medium enterprises are generally not available for public review, making local communities are more likely to suffer adverse impacts from the exploitation of minerals. To date, there does not appear to be a civil society organization or other entity actively serving as an advocate for local communities in this sector (World Bank 2005; ICMM 2011; Larsen 2008). Studies of the impact of Lao PDR’s two large mining operations reveal mixed results. By industry estimates, the operations have created 30,000 jobs. MMG Sepon and PBM annually contribute US $500,000 and US $300,000, respectively, to community development trust funds. Since 2003, MMG Sepon has distributed almost US $3 million on community development programs. Despite these payments, local communities remain poor, and the natural resources they depend on for their livelihoods are vulnerable to negative impacts from the mining operations (ICMM 2011; World Bank 2005). The legal framework governing minerals in Lao PDR is in a state of transition. The 1997 Mining Law was implemented in 2002. In 2008, the law was revised and renamed the Minerals Law. In 2008, the Minerals Law was approved by the National Assembly and promulgated by the President in 2009. However, the implementing decree has not yet been issued, and no regulatory framework has been created. Accordingly, the law currently in effect and recognized by the Department of Geology and Mineral Resources (DGM) is the 1997 Mining Law (CLC Asia 2012; ICMM 2011; Larsen 2008). Under the 1997 Mining Law, all mineral resources that exist at the surface or under land or water, within the territory of the Lao PDR, are the property of the national community and are subject to the management of the state. The law allows mining activities to be conducted as a state operation, as a joint investment by the state and a foreign or domestic partner, or managed entirely by a domestic entity (GOL Mining Law 1997). Individuals and entities engaging in mining activities must obtain a license. Licenses are available for exploration (three-year renewable term) or for prospecting (two-year renewable term). If the results of exploration warrant exploitation, entities can apply for a mining concession. Applicants for concessions must demonstrate three characteristics: (1) financial and technical capacity; (2) a good and trustworthy background in the mining business; and (3) a commitment to a socioeconomic development plan and environmental impact assessment. Mining operators are required to set aside funds to mitigate any adverse impacts stemming from their activities, including damage to land and natural resources and loss of land and livelihoods. Concessions are awarded for periods up to 30 years, with the possibility of two ten-year renewals. At the concession’s expiration, the operator is required to hand over the enterprise to the GOL without compensation (GOL Mining Law 1997). Artisanal mining is limited to citizens using their own funds. Those who engage in artisanal mining as a profession, whether full-time or part-time, must obtain a license (GOL Mining Law 1997). Limited confirmed details are available regarding the 2008 Minerals Law and its attendant regulations, which await implementation, but DGM officials report that the new law requires investors to contribute to community development funds (World Bank 2011b). The legal framework governing the mining sector suffers from the failure to implement the 2008 Minerals Law, in particular the regulations governing mining operations. The GOL’s decision to enforce a four-year moratorium on new mining investments in July 2012 is one indication of the extent to which the legal framework is inadequate. Large gaps in remain where the current framework fails to identify the following: performance and investment requirements for prospecting and exploration work; protocols for protecting the environment and local communities from mining’s negative effects; procedures to ensure transparency and accountability; and emission standards. With support from several donors, regulations are being developed, and capacity-building is being provided to relevant government agencies (GOL Mining Law 1997; World Bank 2011c; Larsen 2008; LIWG 2012b). The legal framework governing artisanal mining is undeveloped. Local institutions lack capacity to administer and enforce legal requirements, leaving rights to minerals unclear and artisanal miners vulnerable to exploitation (Larsen 2008; World Bank 2005). Primary responsibility for Lao PDR’s mineral resources rests with the Ministry of Energy and Mines (MEM) and the Ministry of Natural Resources and Environment (MONRE), which was created in 2011. The Department of Geology was transferred to MONRE. The duties and responsibilities of the ministries and departments are expected to be articulated in the pending legislation. Under the prior framework, the MEM has had primary responsibility for the following: policy formulation and strategic planning; preparing and implementing legislation and regulations; collecting and processing data on mineral resources and mining operations; and administration and inspection of mining operations. The Department of Geology and Mines has been responsible for the following: assisting in creating regulations supporting the 2008 Minerals Law; ensuring progress in geological surveys and mapping; negotiating all mining contracts and issuing licenses; promoting investment in the mineral sector; and undertaking mineral exploration and analytical services (Phommakaysone and Homsombath 2012). Under the 1997 Mining Law, village administrations have the following responsibilities: monitoring and inspecting artisanal mining activities within the village area; reporting on mining activities affecting the rights and interests of the population; preserving and reporting mineral outcrops within the village area to district officials; facilitating and coordinating mining operations within the village area; and inspecting operations (GOL Mining Law 1997). The GOL revised its Mining Law in 2008 and is drafting the Implementing Decree and related regulations. Despite donor support for technical assistance, implementation of the new legal framework has been delayed, at least in part due to ongoing restructuring of the Ministry of Energy and Mines and the transfer of the Department of Geology to the new MONRE. Delay may also be in part due to complexities caused by existing mining operations and Mineral Exploration and Production Agreements and other agreements that predate the implementation of the 1997 Mining Law or are wholly or partially extralegal (World Bank 2011c; CLC Asia 2012; Larsen 2008). In July 2012, GOL placed a four-year moratorium on new mining projects. The moratorium was initiated in response to various concerns: the number of investors seeking concessions; the adverse impact of mining projects on local communities and the environment; and the challenges the government faces in enforcing existing laws and ensuring adequate protections where there are gaps in the regulatory framework and oversight capacity (LIWG 2012b). In the period from July 2010 to September 2012, DGM has implemented two mineral prospecting and exploration projects as well as some other activities related to regional surveys for mineral resources. Geological and mineral mapping at different scales have been funded by the national budget, with assistance from foreign countries and international organizations. Geological and mineral mapping at 1:200,000 scale currently covers about 55% of the country’s area and is expected to be complete by 2020 (Phommakaysone and Homsombath 2012). The GOL and Government of Thailand have a history of productive cooperation on mineral exploration, including joint efforts to conduct joint training programs and geological surveys and mapping in Xayaboury, Luang Pharabang and Bokeo areas. In the 2010–2015 period, the joint endeavor Thai-Lao Technical Cooperation on Geology and Mineral Resources plans to accomplish the following: expand geological and structural mapping activities; identify and implement strategies to promote geoconservation and geotourism; and develop plans for a geological museum (GOT 2010). Under the Finland-funded Lao-Finnish Mineral Institutional Project (2009–2011), which was implemented by DGM and the Geological Survey of Finland (GTK), the available geo-data sets were unified into the geographically uniform and easy-to-use ArcGIS file geo-database format. The new database includes topographical base data, existing geological maps, mineral databases and concession areas. The project also did the following: provided training in GIS-aided geological mapping for GOL personnel; developed a mine closure procedure; and assisted in the promotion of mineral investments. Project achievements in capacity-building were especially noteworthy; staff members received the technical means and capacity to use the ArcGIS program to add, modify and store geo-data, and produce desired integrated maps to support the fact-based decision making processes at MEM and guide the scientific or practical goals of its departments (Phommakaysone and Homsombath 2012). The four-year, US $8 million Technical Assistance for Capacity Development in Hydropower and Mining Sector Project (2010–2014) is funded by the World Bank with substantial contributions from AusAID. The project aims to increase human capacity and improve the performance of GOL oversight institutions for the hydropower and mining sectors. The activities related to the mining sector include a joint hydropower and mining learning program to build capacity of government staff and generate public awareness across the hydropower and mining sectors. The project will also support activities designed to do the following: improve sector governance and the enabling environment; strengthen government oversight capacity; and promote minerals development. The project includes support for the Secretariat within MEM for coordination and management of project implementation. Delays to the project, attributed to the restructuring of MEM, resulted in a midterm evaluation rating of “moderately unsatisfactory” (World Bank 2012b; World Bank 2011c). The Extractive Industries Watch, operated by the Institute for Essential Services Reforms in Jakarta, is a web portal designed to provide an overview of the extractive industries situation in Southeast Asia. The portal aims to support the exchange of knowledge and experience among civil society actors, governments, members of the business community and others who have an interest in the good governance of extractive industries. This portal is linked to other websites focusing on good governance in extractive industries and to the Extractive Industry Transparency Initiative, an international standard that promotes transparent management and allocation of extractive industry revenue streams. The portal makes reference to the mining sector in Lao PDR but does not yet include information about any particular issues, experiences or strategies (IESR 2012).